XML is rapidly becoming the standard representation format for data interchange, data verification, configuration, RDBMS interaction, remote procedure invocation, and the representation of transformation processes. In all these areas the Java language provides the programming interfaces and tools needed for driving the underlying machinery. The intersection between Java and XML is wide-ranging, and the knowledge required to use them together effectively is expanding daily. 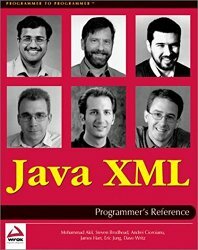 The API section of this book provides quick access to the essential Java XML programming interfaces: SAX, DOM Core, DOM Extensions, JDOM, JAXP and TrAX, together with dozens of illustrative examples. The Tools section includes chapters on Oracle XDK, IBM Web Services Toolkit, Apache XML Project, XML tools for lightweight/mobile devices, and an overview of Sun early access XML projects, all packed with examples and reference material. The final Techniques section explores Java XML over five projects, developing a distributed business casestudy.